Eating healthy is always the prime concern for a pregnant woman. However it is not possible to restrict the menu chart to just subzis, parathas, soups and salads. During the nine months of Pregnancy, there are times when one urges to eat something new and delicious each day. And on days when you feel like turning towards International cuisine, do try some of the recipes from this section to be assured of eating nutritious and home cooked safe foods. Try these delicious food made in different parts of the world to satisfy your hunger pangs. It’s impossible to decide which recipe is the most delicious, but if you consider your taste buds, they know what will make your mouth water. Try your hands on this energy packed Spinach Tahini Wraps which are rich in Protein, Fibre, Vitamin A, B-complex vitamins, Calcium, Iron, Magnesium, Phosphorus and Zinc. So much of goodness in one recipe! Fruit and Lettuce Salad, Apple Cinnamon and Oats is a recipe where Oats are cooked with almond milk, laced with cinnamon and topped with apples and walnuts, this is one bowlful that you are sure to enjoy. Almond milk gives loads of protein for your bones and keeps all the cells of your body healthy. Walnuts add some omega-3 fatty acids to your diet. Try desserts like Stuffed Carrot Halwa Pancakes are nutritious and will also leave you satisfied. This pancake is created with healthy ingredients like wheat flour, carrots and milk powder. Refresh yourself with this Spinach and Mint Juice a cool and healthy cleanser you can start your day with. The lemon in it will help in absorption of iron, digestive oils in mint aids digestion. This soothing Almond Milk is pure and gives protein, calcium and iron, an instant recipe which does not require and soaking of almonds and then straining the blended milk. Almond milk can be used as a base for making many recipes like Avocado Almond Milk and Healthy Peanut Almond Milk Oatmeal. Healthy Peanut Butter Blueberry Almond Milk Smoothie is a delightful recipe rich in the antioxidant resveratrol, Vitamin A and Calcium. 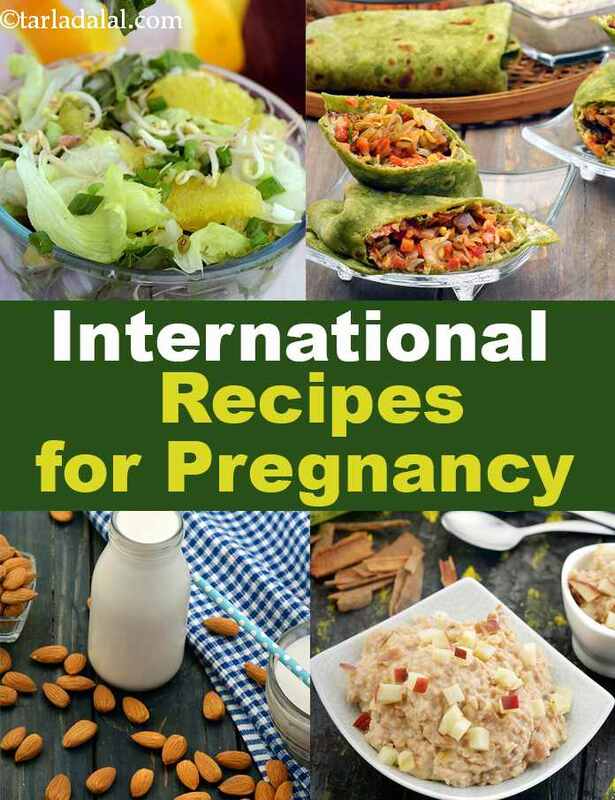 Enjoy all our international recipes for pregnancy. Explore more varieties in our pregnancy section everyday.